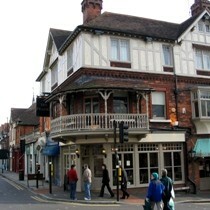 The Peahen in St Albans has changed a lot since the refurbishment in 2005. It has moved from being a popular haunt of the teenagers to being THE pub for smartly dressed trendy people in their mid-twenties to thirties. The bar staff are friendly, efficient and smartly dressed, however the price of beer and wine is quite expensive. This is a classy, smart place and many drinkers are prepared to pay a little extra to drink in a place like this. McMullens brewery own the Peahen so this meant poor choice (and quality) of real ales; Country & Cask. Often only one real ale is available. There are a few premium draft lagers to choose from including Nastro. The Peahen is particularly busy on a Friday and Saturday evening when normally it is standing room only. It is quite a large smartly decorated pub with seating at the front and back. The atmosphere is good; busy without being too noisy and crowded and the clientel make an effort to dress to impress when they come here. There is as many women as men in this pub and the Peahen does seem to attract good looking people. Food is served all day and is a step up from standard pub food. Large patio area with heaters at the back which is very popular in the summer. Jazz and Tapas evening on Tuesdays. Patio at the back is very popular in the summer evenings with around 100 people drinking and eating on a Friday or Saturday evening. Poor quality ale, often only one real ale available. Drinkers were mostly smartly dressed in the mid-twenties to thirties age range.